I hurriedly walk through the packed rooms of Wolstenholme Creative Space, pushing through people who have gathered all around Ria Fell’s darkly beautiful gothic portraits and are slowly trickling into the front room of the reappropriated house, the room with the large gated windows, which seems more than an appropriate space for the ensuing performance. Rushing, eager not to miss anything, I hear people excitedly talking about what is to come. A sign by the entrance had warned visitors that tonight’s performance would contain “Scenes of an adult nature, and vomiting”. This caused something of a stir. 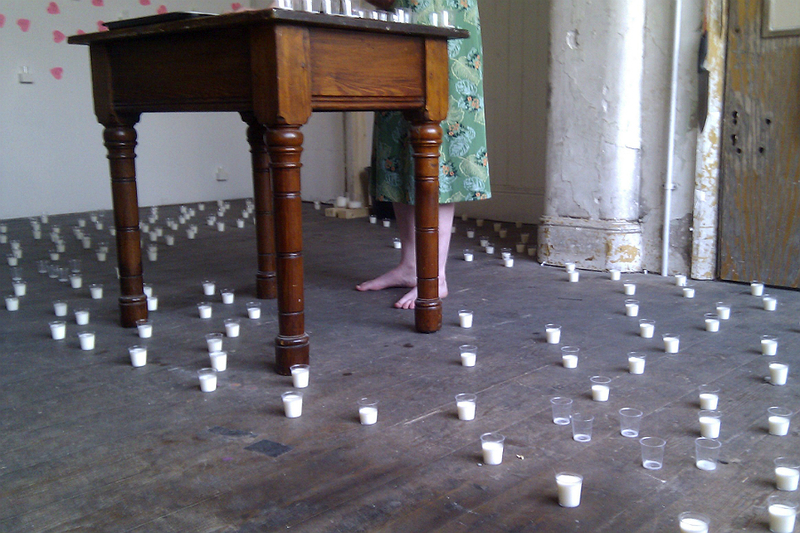 Whispering excuses to those already lining the walls and sat on the floor facing a vintage looking Julieann O’Malley, I am careful not to tread on any of the 400 shot glasses which contain a white, viscous fluid: the Salty Milk to which the title of the performance refers. O’Malley stands, hunched over an antique wooden desk, scribbling “I Love You” over and over again onto fluorescent pink heart-shaped post-its. Next to her lie two enormous carving knives, their handles bound with a single thread of red wool. These are reflections of the twenty or so additional knives which hang, blocking the door; creating a subverted domestic prison, sinisterly swinging whenever the bass of O’Malley’s carefully created soundtrack kicks in. I settle down by the window, in the corner, sitting awkwardly cross-legged on the floor, cramming myself into one of the only free spaces and watch as the artist’s bare feet tread around the shot glasses until she reaches the far wall, onto which she transfers the post-its currently covering her arms. On this wall, there are more shot glasses, each placed on an individual shelf, and as she sticks the hearts to the wall, she slowly begins to drink. I wasn’t quite prepared for the sensation of watching someone imbibe something I know tastes vile; and so carefully, daintily and calculatingly. I realise this will be more painful to watch than anticipated, and I (in some ways) will not be proven wrong. After she leaves the wall and begins to move around the space, I see things I hadn’t noticed on arrival, being so struck initially by her altered appearance and the layout of the room. The first thing that I now see is a large pig’s head, plunged onto a wooden stake at the back of the room. Partially melancholic, partially comedic, given the softly closed eyes and the slightly parted mouth whose upturned corners verge on a smirk, the site of a disembodied pig head is an odd one indeed. I wonder why I hadn’t noticed this earlier, and I realise it is probably because it is the least shocking prop in the room. It’s the one thing that can’t do any real harm to either the audience or this person I hardly recognise, done up as she is, as a fifties housewife, with a roller curled into her forelock, and a false external womb, glowing red. Her face perfectly painted, complete with false eyelashes, lipstick and smoky eyes. The make-up on someone I know to never usually wear a smudge of the stuff, not only pushes and pulls with the concept of performative, false versions of femininity, but also enhances the severity of O’Malley’s facial expressions. It works in the way in which over-done faces work in larger theatres; every movement of her lips, every glance, and every stare is accentuated, which transforms the moments of her severe confrontation with the audience into an even more intimidating affair. It is the ideas of confrontation, of the visceral, and of domestic femininity which are central to this performance. O’Malley hands the audience artefacts of childhood which have been contaminated by this dark, surreal, almost farcical space. She offers hand-iced gingerbread men and love hearts to the crowd upon a baking tray, and stands glaring at them until they pick something up. This is not maternal care so much as maternal manipulation; a power play which brings to mind the often dysfunctional (potentially damaging) domestic dynamic within which women find themselves. She is causing the audience not only to witness this, but also to be submissive to her control: she is making them consume, making them swallow, these trite and idealised signifiers of love, home, and childhood happiness. Like the paper money she pulls from a mock washing-line and stuffs into her mouth, she is forcing received information upon us, aesthetics and hierarchy. Placing this consumption in such a sublimely dark, jarringly surreal atmosphere highlights the farcical performativity involved, thus allowing us to question the validity of those things we rely upon and take for granted; to question the accuracy of stereotypes (gender or cultural). About halfway through the two-hour performance, O’Malley steps over the shot glasses and stands in front of the pig. She picks up a large beaker of a thick white solution and begins to smear it across the animal’s inanimate face. When it is mostly covered she picks up a small white plastic spatula and begins to almost shave the pig, scraping the white gloop back into its original beaker. She does so carefully, methodically, and with a great level of care. When most of it is off, she take a wet cloth and wipes the remnants from the pigs face, putting her fingers inside its slightly agape mouth and nostrils, to remove any traces of white. She holds its face, looks at it, and smiles. The pig has been made entirely emasculated. Previously the silently judging bystander it has been drawn into the space and made (it and the concepts it represents) both ridiculous and devoid of any latent, quiet power. This is enhanced when she takes the beaker containing the scrapings, faces the audience and drains it completely; her head tilted back as she pours the tainted yoghurt into her mouth. In doing this she not only triggers associations of the unclean, of contamination, but, conversely, also completely decimates any negative associations between the pig and the female by interacting with the figuratively castrated animal in such a manner. She makes it a part of her maternal, domestic ablutions, controlling it completely. Here, consumption may seem to be the ultimate power, to consume that which held power over you. And yes, it is consumption which ultimately colours this piece, but more important than that, is an eventual rejection. Because the pivotal point in this piece is when the performer begins to vomit. As a result of constantly drinking milk to which salt has been added, about 80 minutes in, O’Malley is obviously in a great deal of discomfort and is visibly nauseous. The trauma she is subjecting her body to and the obvious distress which this naturally causes begins to unsettle the audience. She drops to her knees, palms on the floor and hangs her head, her breathing laboured, and then, without ceremony or affectation, she brings up a small amount of white liquid. And mouths a quiet apology to the guy sitting closest to the occurrence. Composure regained, she continues to drink, and also, to vomit. It is not quite the over-acted Linda Blair affair some may imagine, but rather a quiet, ritualistic rejection. With this physical act, she illustrates the oppressive and unnatural nature of those concepts which are so often accepted unquestioningly by so many, and then systematically discards them, philosophically and bodily. She has taken them on, found them to be completely tainted and emitted them as waste. By asking the audience to sit through this, to be brought into her dark pastiche of a familiar environment and then to so subvert and corrupt it creates a feeling of unease, of the unhiemlich. For me, this performative piece is all about questioning normally accepted concepts as well as acting as an anti-Freudian exploration of the feminine domestic. O’ Malley, at one point, vomits into a gaffer taped square of floor which she has intermittently scrubbed clean throughout the performance and continues to work her regurgitated material into the dirty, wet wood. I cannot help but laugh at the domestic irony of the image of this faux-mother cleaning the floor with her own puke. Particularly when it is made up mostly of milk, and salt. She is at once mother and child, feminine and creative, but also ultimately in control. If her body is to undergo any trauma, it is totally on her own terms, by her own hands.